My kids have known for months what they were going to be for Halloween (a doctor and Super Girl–seriously their costumes are so stinking cute) and we’ve had spiders, ghosts and those silly cotton cobwebs all over our house and front yard since October 1, but somehow Halloween has snuck up on me AGAIN! 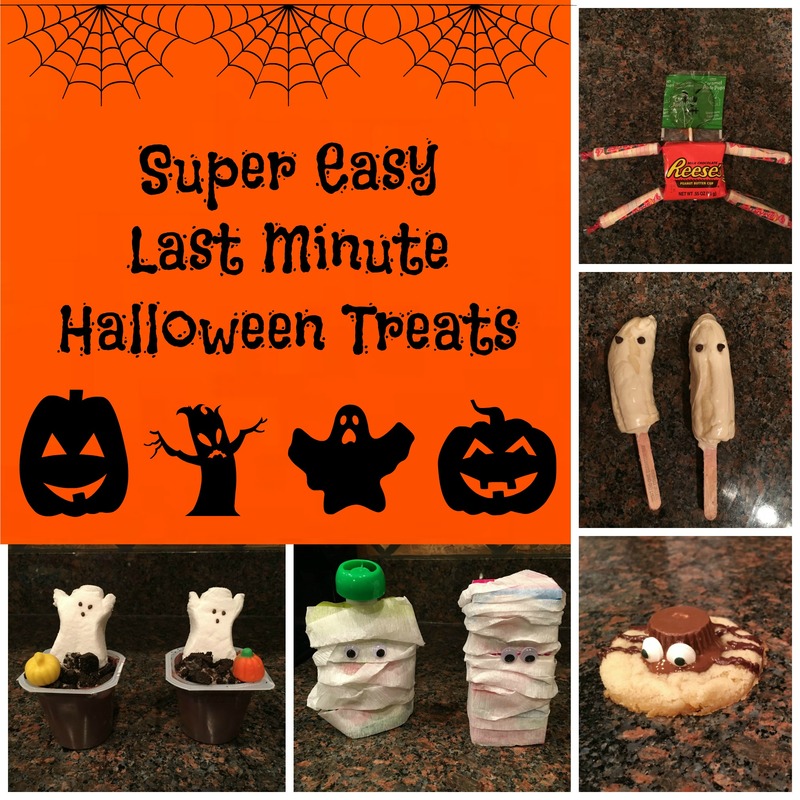 In an attempt to get in touch with the Pinteresty- Mom I so long to be, sigh, and the reality that I have zero time, I’ve got five super easy, last minute Halloween treats that anyone can make. Want to make a treat for your kid’s class that looks like you spent a ton of time, but is secretly super easy? Then Crazy Candy People are perfect. 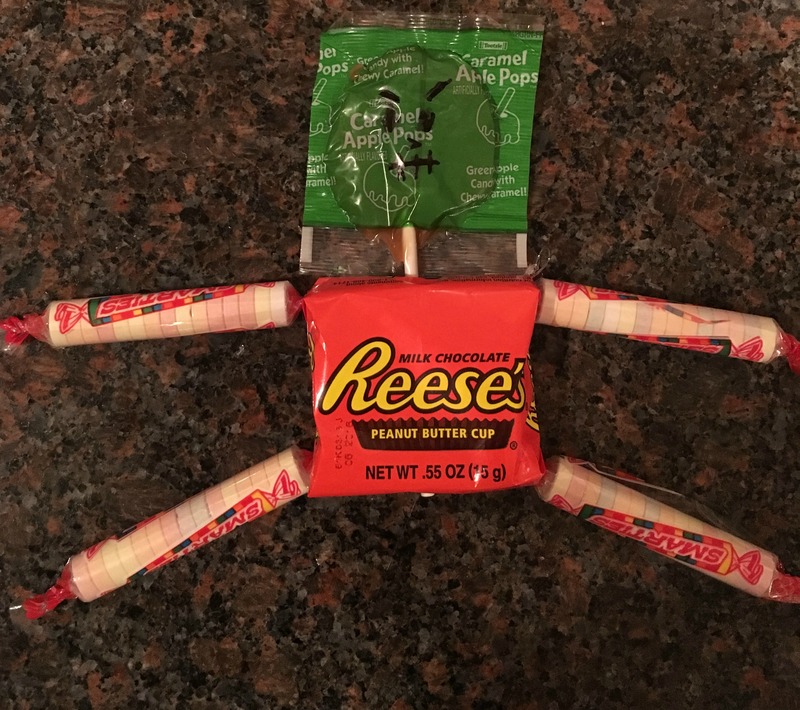 With a little hot glue or tape attach a lollipop to a tiny candy bar, use Smarties as arms and legs, draw a scary face with a black sharpie on the lollipop, and these treats will be the hit of the party! I love this treat because kids can help you assemble them while at their classroom Halloween party or at home! If you are sending this treat in, you could put everything in small baggies and give the kids instructions on how to assemble or put this snack together as a class. 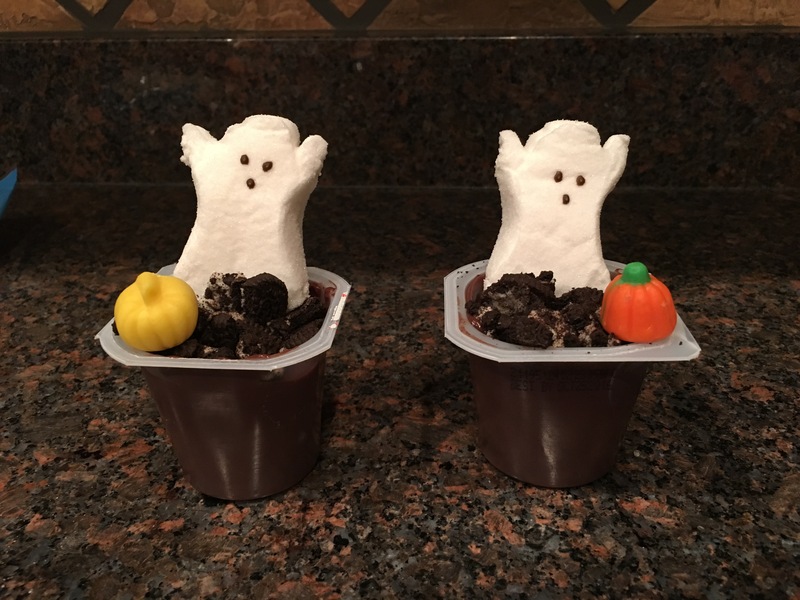 All you need is pudding cups, crushed Oreos, marshmallow ghost, candy pumpkins. What an easy, spooky, sweet treat. Everything is cuter with edible eyes! Everything! 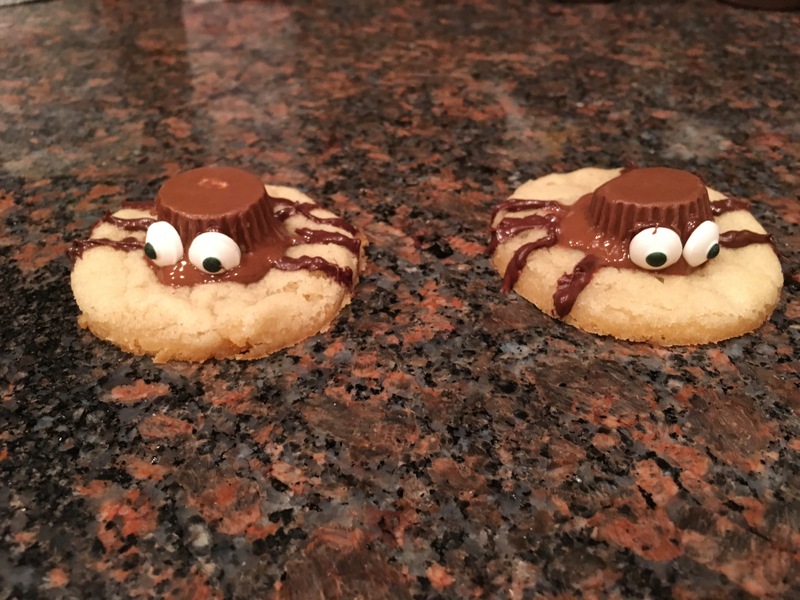 Using your own sugar cookie recipe or the store bought from the tube, follow directions to bake the cookies When done, add a tiny peanut butter cup upside down and use a small amount of melted chocolate to as clue to attach candy eyes (you can find these at your craft store’s baking section). Dip a toothpick into the melted chocolate and draw on the legs. How cute are these cookies? 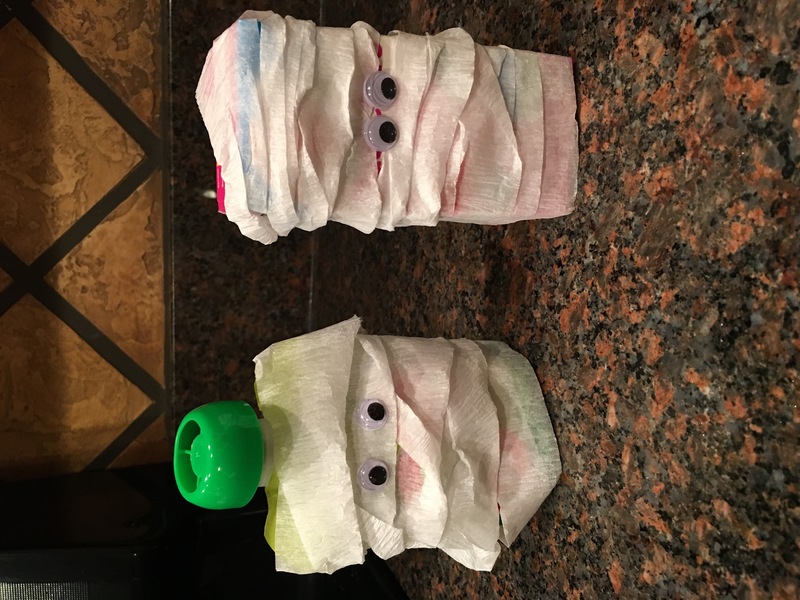 Wrap white tape or crape paper around a juice box, applesauce pouch, or even a small water bottle and add googly eyes with a little bit off glue and you have an easy and adorable mummy!I LOVE these and my kids think they are hilarious! For this easy treat, cut a banana in half and put a popsicle stick in the bottom. Dip the banana in melted white chocolate, add tiny chocolate morsels for eyes and put in the freezer for 15 -20 minutes. 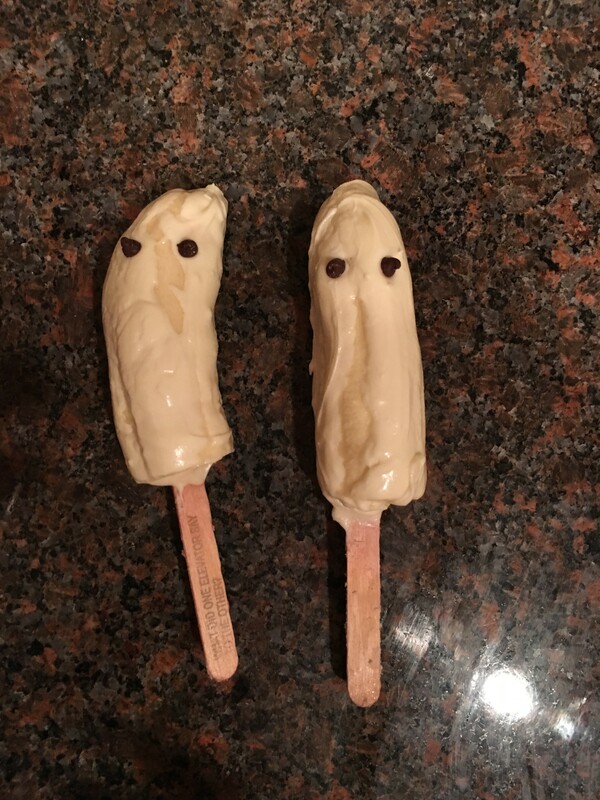 Now you have a spooky ghost banana. Easy and yummy! Happy Halloween! And remember, as a mom, you get half of all their candy and treats. It’s a rule. I swear! Date Nights at Home and Easy Halloween Treats! Silly me! I’ve been over at the DC Ladies writing about awesome date nights that don’t require you to leave your house and simple Halloween treats that would any rushed Mamma can make!